Perennial Sun Height 2 - 6" Spread 3 - 6' Spacing 18 - 24"
HABIT: Coarse perennial that spreads from underground stems. 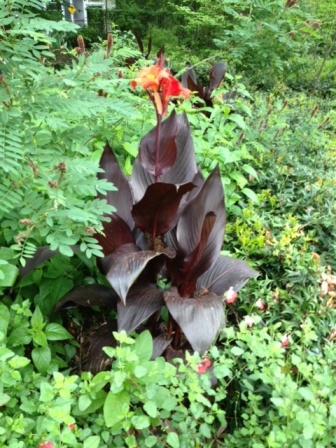 Large leaves and flowers. Most popular is dwarf red. Dies to ground at frost, returns the next spring. CULTURE: Full sun, loose soil, plenty of water and healthy amounts of fertilizer for good blooms. Cut stems to ground after freeze. Tolerates wet feet. USES: Use as a background flower or in large open areas. NOTES: Easy to grow but too coarse for most residential gardens. Native to the tropics. 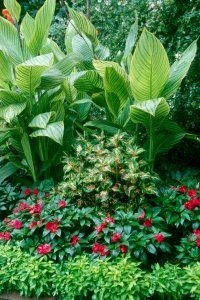 The red foliage selections tend to have smaller flowers but are better-looking plants.